Whoever said you could never go home again never met Seattle Seahawks’ Richard Sherman. 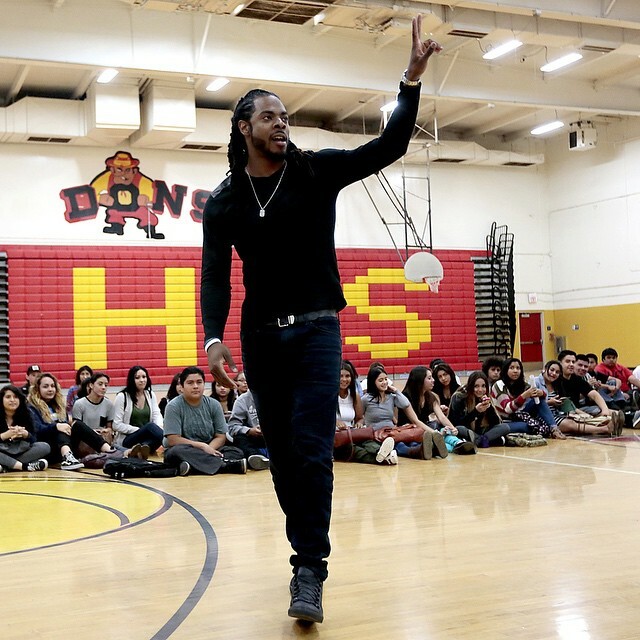 He made a surprise stop at his old high school –Compton Dominguez High–to give the grind hard and reap the benefits spiel. May sound cliché but he did beat the odds in getting out of South Central, getting accepted to Stanford and really crushing statistics entering the NFL. So, listen up kids. According to LA Times, Sherman praises his parents for giving him a good foundation by being hard-working and supportive. Not everyone has it like that, unfortunately. Sherman is sympathetic to that, saying that’s how many fall through the cracks. However he still suggests being responsible for your choices. It’s one of many visits the cornerback has made to his old stomping grounds, but a first for tackling Trig problems on the blackboard. Brave man…to be fair he got an assist from a kid I’m guessing studies complex math problems like Sherman does those X and O’s. After sprinting out the classroom, Sherman held a Q&A session in the school gym and took selfies with the teens. Best. School. Day.Ever. Unless you’re a Patriots fan. The mentoring meetup will be televised as a commercial, so keep your eyes peeled.